As one of the Project Engineers, you are responsible for the design, calculation and planning of new projects and the preparation, support and engineering of current projects. Handling quotation for potential new projects. Work as part of the projectteam closely with projectcoordinator and fieldsupervisor to ensure delivery of the project within scope, time, budget and customer satisfaction. Perform all necessary engineering and work preparation activities for new and ongoing projects, including lists of materials. Creating the required project documentation, as well as the drawings and transferring it to the Operations department. Completed education in HTS Mechanical Engineering /Installation Technology or equivalent. 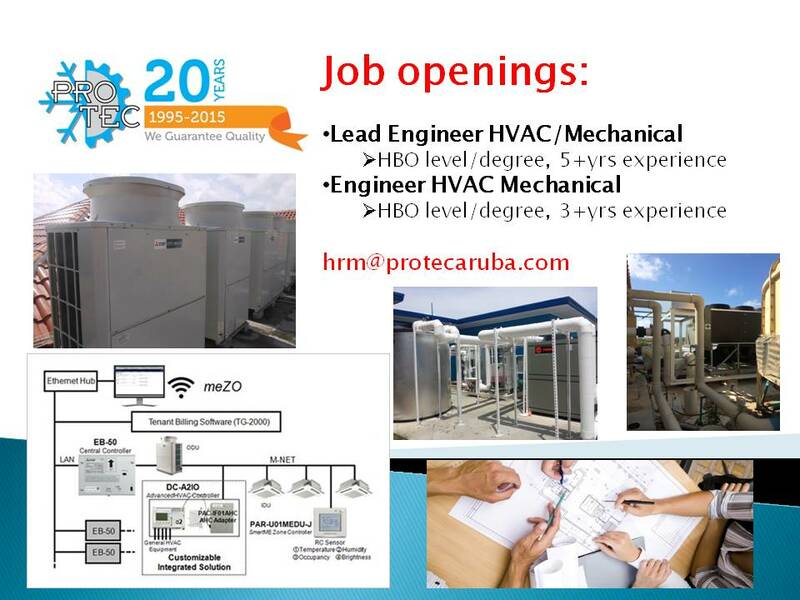 Minimum 5 years experience in HVAC projects. Knowledge of engineering and design in relation to measurement and control systems and building management in installation. Excellent oral and written fluency in English, Spanish, Papiamento and Dutch. Strong communication skills, good listening skills and empathic attitude. Experience in working with MS Office, AutoCad and/or other engineering tools.